Science of the Saints, 10-XI-2018 (28 Oct.), Holy Martyress Paraskeva of Iconium. The Holy Martyress Paraskeva, named also Piatnitsa, lived during the third century at Iconium in a rich and pious family. The parents of the saint reverenced especially the day of the Passion of the Lord, and therefore they called their daughter Paraskeva this name, since she had been born on a Friday – Piatnitsa – and the name Paraskeva in Slavic translation from the Greek means also Piatnitsa -Friday. Young Paraskeva with all her heart loved purity and the lofty morality of the virginal life, and she took a vow of celibacy. She wanted to devote all her life to God and to the enlightenment of pagans with the light of the faith of Christ. Upon this righteous path Saint Paraskeva was brought to judgment, bearing in her own name the memory of the day of the terrible sufferings of Jesus, and she shared in the Passion of Christ also in her own life through her bodily torments. Because of her confession of the Orthodox faith, the pagans in a frenzy seized hold of her and brought her to the city governor. Here they demanded that she offer unholy sacrifice to the pagan idol. With a steady heart, and trusting on God, the saint refused this demand. For this she underwent great torments: having tied her to a tree, the torturers tore at her pure body with iron nails, and then exhausted by the torture, they threw her into prison, all lacerated to the bone. But God did not forsake the holy sufferer, and miraculously healed her torn body. Not heeding this divine miracle, the executioners continued with their torture of Saint Paraskeva, and finally, they cut off her head. 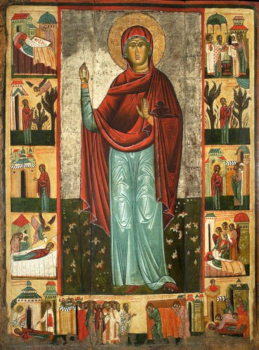 By Church belief, Saint Paraskeva is protectress of fields and cattle. Therefore on the day of her memory it was the custom to bring fruit to church for blessing, which as a blessed object was kept until the following year. Moreover, Saint Paraskeva is prayed to for protection of cattle from disease. Saint Paraskeva is likewise an healer of people from grievous illness of both body and soul.